In this guide we’ll take a look at the best pruning saws for the UK market. The Bosch EasyCut 12 Cordless NanoBlade Saw is easy to use in even difficult places in the garden. The Lithium ion battery makes it really powerful and it lasts for hours between charges. It is also quick to recharge. The battery also works on several other power tools, so you can buy them without a battery and use the same battery for them all. The NanoBlade saw works in a similar way to a chainsaw except it is, of course, much smaller. Its soft grip handle makes it easy to use and it doesn’t vibrate as much as some electric saws which gives a nice feeling of control and doesn’t leave you with trembling hands when you have finished! This product produces nice clean cuts on branches that are too thick for loppers or secateurs. It’s the best pruning saw for the UK market. This Bosch PSA 700 E Sabre Saw makes it a great choice if you have a lot of pruning in the garden. The 710 watts give you enough power to get through the toughest jobs with ease. The pruning saw is comfortable to use being light and having an ergonomic soft grip handle. As well as being useful in the garden, this saw will come in handy for lots of DIY jobs, too. It comes with one saw blade suitable for cutting wood. Replacements and other saw blades, for example, metal cutting blades are available. The blades are easily changed without the need for tools. The only drawback is that it doesn’t come with a case. I would recommend this electric saw if you are renovating a very overgrown garden or removing trees or large shrubs. I would also recommend this as the best pruning saw if you have a variety of garden and DIY jobs you wish to tackle. This Silky Zubat Professional Curved-Blade Pruning Saw is the professional’s choice and is used by tree surgeons and arborists worldwide. It cuts through thick branches like a knife through butter and will last for years. The chromium blade is resistant to corrosion and resin and it has a moulded rubber handle that is strong and comfortable to use. This saw can also be mounted on a pole so that you can reach higher branches with ease. It also comes with a scabbard for safety and ease of use. 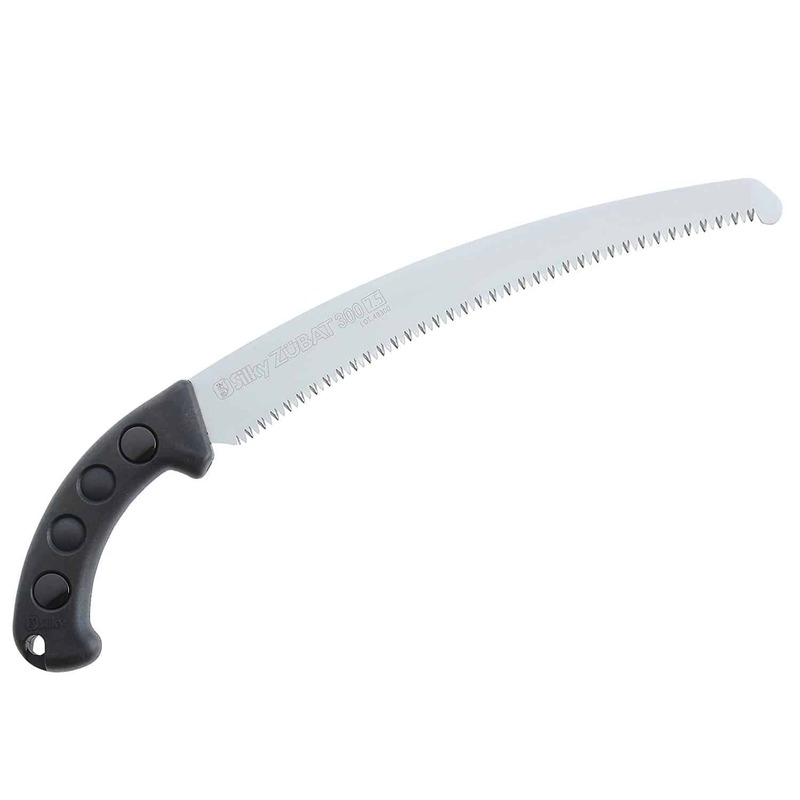 This pruning saw makes the perfect tool for most pruning jobs in the garden. The 13-inch blade can handle large branches easily. Its also a useful tool to have even if you have a chainsaw or electric saw as it can tackle flexible branches that get in the way of working with power tools. This Silverline Extendable Pruning Saw is perfect if you don’t want to use a stepladder or do any climbing! It is lightweight but effective, in fact, it is sturdier than it looks, making pruning even fairly large branches easy work and not too much of a strain on the arms and shoulders. The pole can be used at various lengths as it has three extending sections. The sections lock into place securely but are easily adjusted. The curved blade of this pruning saw makes it easier to use and it can easily get into tricky spots between branches. The hook end of the blade is also useful for pulling off ivy and climbers. This Felco F600 Folding Pull-stroke Pruning Saw is a really handy tool. It is especially useful if you have a small garden and not much storage space as it would easily fit in your kitchen drawer. It would also be useful if you had an allotment or did conservation work as it is so compact and easy to take with you. The steel blade is chromed to make it rust resistance and the saw needs no maintenance. The way the blade is designed means it doesn’t get clogged up with fibres and sap, so you can keep going without having to clean it. It also makes a nice fine cut. If you have a small garden with just a few small shrubs to prune this is the ideal tool. It is also handy as a second tree saw perhaps in addition to an electric one, for smaller jobs around the garden as it is so light and easy to use. Cutting back trees and overgrown shrubs can be a difficult job, but the best pruning saws can make it less of a struggle. A good pruning saw makes light work of even the toughest branches and also ensures a nice clean cut that prevents diseases getting into your plants. Using the right tool for the job is important for your own safety as well as the health of your plants. There are a variety of choices available and I have outlined those that, in my view are the best pruning saws for the UK market. Personally, I use the Bosch Easycut Cordless Electric Pruning Saw, as it’s super easy and makes light work of most branches. But other options may be more suitable for you depending on your garden. The secret to choosing a good pruning saw is to find the right one for your needs. What you choose will depend on your garden as well as your strength and mobility. Choosing the right tool will also make for safer gardening. For occasional use on a small garden, a simple manual saw will do the job, however for a large garden with lots of shrubs or trees then you might want to consider easing the load by using an electric saw. When looking for a saw check that it is sturdily made and not of flimsy construction. With electric saws, make sure replacement blades are easily available. With manual saws, check that the blade is rust resistant. With an electric power tool, you might want to check that it has a two-button operation as this means it can’t be turned on accidentally. When buying your tree saw, you might want to consider also purchasing additional blades for power tools, a file for sharpening manual saws and of course safety equipment including thick gloves and eye protection. How Do You Use A Pruning Saw? You should use a pruning saw for any branches that are too thick to be easily cut with secateurs or loppers, otherwise you could damage these smaller tools. When tackling pruning jobs in the garden be sure to consider safety at all times. Pruning, especially when using electric tools and stepladders can be dangerous. Only tackle trees and shrubs that are well within your capabilities as falling branches are very heavy. It is also highly advisable to use gloves and eye protection as well as a safety helmet if you are climbing or working on a stepladder. Make sure you have a clear space to work and that there is no one around that could get hurt. If you are cutting back whole branches you should start by reducing the branch gradually from the end. Large branches are heavy and can fall unpredictably, so break the job down into safe sections. If branches split because of the weight of the rest of the limb this can lead to a tear rather than a clean cut which can be bad for the health of your plant, so this is an additional reason to reduce the weight of the branch by gradually cutting it back. Particular care should be taken when using a pole saw as heavy branches falling from a height are potentially very dangerous. Again, reduce the branches gradually. Before making each cut, have a good look to make sure you have room to make the cut without damaging nearby branches. Wherever possible cut from the top to the bottom so that you have gravity on your side. Make sure you can make the cut keeping the blade straight so that it does not get stuck halfway through. Position yourself securely, with a wide stance and ensuring your feet or on secure ground, this is especially important if you are using a power tool. If you are using a ladder, make sure it is securely positioned. When using a manual saw, make a groove by drawing the blade back several times in the place you want to make the cut. This will prevent the saw from slipping. If you are using a power tool with adjustable power, then start slowly and speed up gradually. When you have removed the branch, tidy up any splintered wood with the saw to leave a clean finish. When the whole job is complete, clean your saw and store it in a dry place well out of reach of children. How Do I Clean My Pruning Saw? Sap, resin and sawdust can soon build up on your pruning saw. It is important to clean it regularly, otherwise it will become corroded and less efficient. This will make the work harder and also cause damage to your plants. In addition, you can easily spread diseases if you do not keep your pruning tools clean. If you are pruning diseased plants, or just as a protective measure, keep a container of rubbing alcohol or disinfectant handy and dip the blades in this between cuts and then wipe dry. Obviously, do not dip power tools in water but simply wipe the blades if necessary. To remove the sticky sap residue from your pruning saw after use you can use a wire brush and paint thinner or white spirit. Once you have finished work for the day always clean your saw, removing any sticky residue and wipe the blades of a manual saw with a rag dipped in light grade machine oil to prevent rust. Can I Sharpen My Pruning Saw? Some Silky saws can be sharpened though those with impulse hardened blades cannot. However, these should stay sharp for a very long time, with general home use a Silky will stay sharp for years and years. Replacement Silky blades are available. Other manual saws can be sharpened. It is a bit of a fiddly process, but worth doing as a sharp blade makes sawing much easier. It is also better for your trees and shrubs as a sharp blade will make a cleaner cut. So, here’s how to do it. Wearing thick work gloves, clean the blade of your saw with soapy water and a stiff brush and wipe it dry. Secure your saw with clamps or a vice so it doesn’t slip. You can sharpen the saw blade with a small, round file. However, for best results, use a Cant file which is a triangular shaped file and makes the job a little easier and more precise. This file fits between the teeth of enabling it to sharpen each tooth. Start from the rear of the saw and work toward the tip. Sharpen the edges of the teeth pointing away from you one-by-one. This will be alternate teeth and you will be sharpening the flat side not the bevelled edge. Give each tooth the same number or strokes of the file to ensure even sharpening. A very blunt saw might need 10 or more strokes on each tooth, but if you do it regularly a few strokes on each tooth will be fine. Once you have reached the end of the saw, turn it around, re-clamp it and do the same to the other side.